The 35th Annual Mama Liz Absolutely Free Thanksgiving Dinner will take place from 12 noon – 4 pm at the HB Kiwanis Club, at 2525 Valley Drive. Happy Thanksgiving Everyone! The City of Torrance Community Services Department invites the entire family to participate in the 39th Annual Harry Sutter Memorial Turkey Trot Fun Run. A three-mile fun run begins at 8 a.m. on Thanksgiving morning. After the fun run, there will be a post run prize drawing for mountain bikes, dinner vouchers, gym memberships and other items. $30 per person. For questions call (310) 618-2930. For registration information visit torranceca.gov/our-city/citywide-special-events/turkeytrot. Enjoy your Thanksgiving meal amongst fish and sea otters this year at the Aquarium of the Pacific. Feast on a traditional Thanksgiving buffet in the Aquarium’s Café Scuba and then explore the more than 11,000 animals from the Pacific on view. Definitely not your typical Thanksgiving setting! 11 a.m. – 3 p.m. 100 Aquarium Way, Long Beach. Adults $60. Children $32.50. Make reservations at Aquariumofpacific.org or call (562) 590-3100. The 35th Annual “Mama Liz” Absolutely Free Thanksgiving Dinner and musical concert and variety show. Free to everyone. noon – 4 p.m. Hermosa Kiwanis Hall, 2525 Valley Drive, Hermosa Beach. 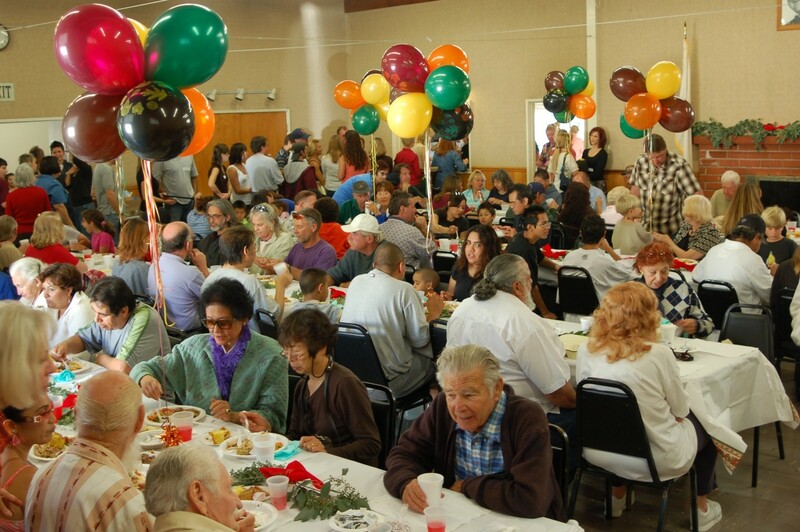 Free Thanksgiving meal at the South Bay LGBTQ Center. 11 a.m. – 1 p.m. 16610 Crenshaw Blvd., Torrance. Donations accepted. For questions call (310) 328-650. southbaycenter.wixsite.com/southbaylgbtcenter. Hermosa Beach Farmers market is a great place to shop for fresh fruit and vegetables, have lunch and pick up food for the weekend. Pick up some hummus, Tammie’s Muffins, and Harry’s Berries. 1035 Valley Drive, Hermosa Beach. For questions call (310) 989-3655 or visit hermosabch.org. Small Business Saturday is a day of support for the small businesses that their community thrives on. Many of our local businesses are run by residents who live and work in Hermosa Beach, and we’ve got some great options here with all sorts of cool holiday gifts. Come walk around Hermosa Beach and shop local. 200-plus sellers transform the streets of downtown Torrance into an eclectic open air flea market with antiques, furniture, vintage clothes, jewelry, LP’s, plants, toys, home decor and more at bargain prices. 8 a.m. – 3 p.m. Sartoria Avenue and El Prado, Downtown Old Torrance. For information call (310) 328-6107 or visit torranceantiquefaire.com. North Torrance Youth Musicians Ensemble and St. Cross Episcopal Church presents the ninth annual Handel’s Messiah Sing-Along. 3 p.m. St. Cross Episcopal Church, 1818 Monterey Blvd., Hermosa Beach. Donations accepted at the door. Stcross.org. Families Connected Parent Chat, presented through a partnership between Beach Cities Health District and South Bay Families Connected, is a free support group open to all parents. Led by a licensed professional from the Thelma McMillen Center at Torrance Memorial Medical Center and provides an opportunity to discuss shared parenting challenges. 10 – 11 a.m. Beach Cities Health District, 514 N. Prospect Ave. Suite 102, Redondo Beach. For more info visit southbayfamiliesconnected.org. Free. No registration required. The City of Hermosa Beach free holiday parking starts today in downtown areas through Dec. 25. Free holiday parking on all silver-post parking meters within posted meter time limits. Participating meters will be wrapped in festive red holiday covers. Happy Holidays compliments of The City of Hermosa Beach. hermosabch.org. Torrance Memorial Medical Center’s 35th annual Holiday Festival fundraiser features more than 36 themed, decorated trees, live entertainment, the South Bay’s largest holiday boutique, opportunity drawing, children’s activities and food court; $5 general admission. 1:30 – 3:30 p.m. Torrance Memorial Medical Center, 3330 Lomita Blvd., Torrance. Call (310) 517-4606. Visit TorranceMemorial.org/holidayfestival for more information, additional viewing days and times.